These Plants usually grow on the shady Banks of Rivers, rising with many slender pliant Stems to the Height of twenty, and sometimes thirty Feet, being supported by Trees and Shrubs, growing near them, on which they climb and clasp their Tendrils. 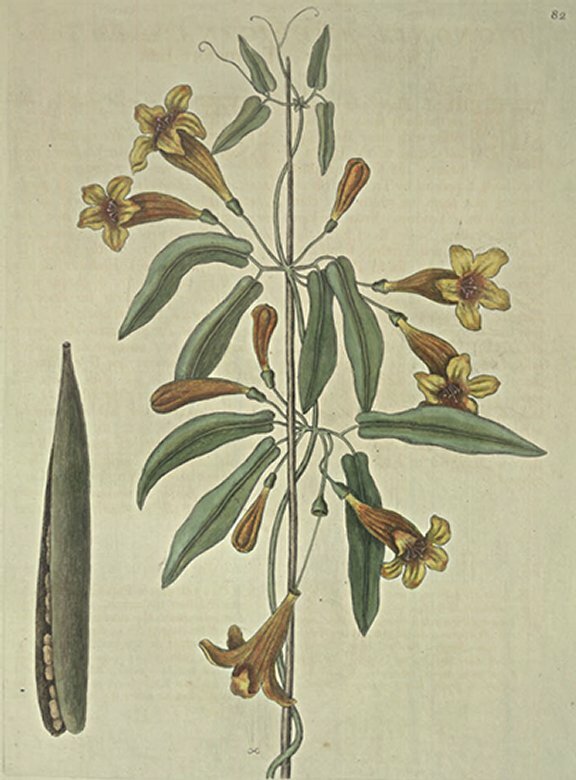 From the joints of these trailing Stalks shoot forth their Leaves, Flowers, and Tendrils, four Leaves grow at every Joint, set by Pairs on two horizontal short Stalks: The Flowers are set on Footstalks, of above an Inch in Length, are monopetalous, and divided into five sections, which reflect back, and are of a bright yellow within; but the outside of the Flower is of a bright Cinnamon Colour, and has within it four Stamina with a Stylus. The Seeds are winged, and fixed to a Placenta within a Pod. This elegant Plant is a Native of both Virginia and Carolina, and blows there in May, but in England not before August. N. B. In the following Plates are interspersed some remarkable Butterflies, whose Colours are so various and intricately blended, that their Figures and Descriptions, would give but a faint Idea of their Beauty, without being illuminated; which alone answers the Purpose. But as some Copies may appear uncoloured, it will be necessary to supply that Deficiency by Words.